The forecast delivered on the opening day of the 2018 Ulsan PWA World Cup as winds of 15-25 knots greeted competitors to provide a pulsating start to the event. The conditions were anything but easy though with the treacherous chop claiming numerous victims throughout the afternoon, while the bitterly cold temperatures presented an equally stern challenge. At the close of the play two familiar names sit at the top of the overnight rankings with current world tour leaders Delphine Cousin Questel (Starboard / S2Maui) and Antoine Albeau (RRD / NeilPryde) setting the pace again - just as they did in Japan last week. Delphine Cousin Questel (Starboard / S2Maui) holds a healthy lead at the top of the event rankings after a great first day. The two-time world champion started proceedings with a solid second place - before the 26-year-old blew the rest of the competition away in the second winners’ final of the day as she led from start to finish to claim an emphatic victory, which sees her hold an overnight lead of 6 points. Cousin Questel’s closest rival at the moment is Jenna Gibson (Fanatic / NorthSails), who is only competing in her 3rd PWA Slalom World Tour event. The Brit made a dream start as she overtook Cousin Questel on the second leg of the opening final and then remained cool, calm and collected over the remainder of the course to earn to her first bullet on the world tour. The 20-year-old then won her semifinal in Elimination 2, but could only muster an 8th place in the final, which saw her lose the event lead, but she will still be delighted to finish the day occupying 2nd place in the current rankings. Esther de Deus (Fanatic / NorthSails) currently completes the top 3 after coping well with the tricky conditions, which saw her finish 5th in the first elimination before going one better in the next to claim 4th. The 26-year-old has steadily improved since 2015 - when she finished 13th overall - to 7th in 2016 and 6th last year and will be hoping she can sustain that upwards trend. 21-year-old Maëlle Guilbaud (Patrik / Loftsails) also enjoyed a consistent day as last year’s World No.5 started the event with 4th and 6th place finishes, while Marion Mortefon (Fanatic / NorthSails) was a little off the pace today after a 5th and 6th place. The current World No.3 will now try to bounce back tomorrow as she chases a 4th consecutive podium finish. Antoine Albeau produced an almost carbon copy performance that saw him win the first race of the year in Japan as the reigning world champion led from start to finish in today’s winners’ final to maintain his perfect record so far this season. The 24-time world champion looks to be in ominous form and it will be interesting to see if anyone can stop him tomorrow. 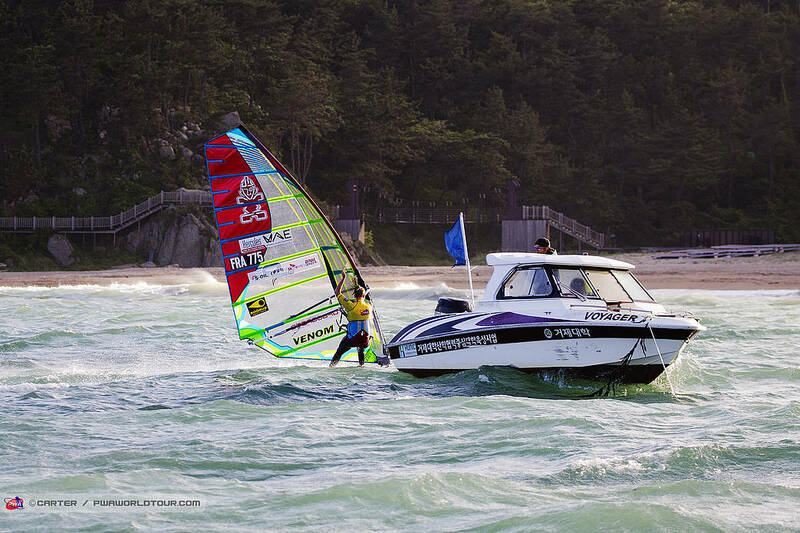 Maciek Rutkowski (I-99 / Challenger Sails) finished the opening event of the season in Japan on a high after winning his first race on the world tour in the foil discipline and when we spoke to him the Pole sounded quietly confident about his chances this season. That became more evident today as the 26-year-old followed up that success in Japan by recording his best result yet in a single slalom race - 2nd - after he came storming down the third leg to overtake several rivals. Fellow title contenders - Matteo Iachino (Starboard / Severne / Shamal Sunglasses) and Pierre Mortefon (Fanatic / NorthSails / Chopper Fins) - both made solid starts to the event with 3rd and 4th place finishes respectively and they’ll now try to build on those results going into tomorrow. In the preview, we mentioned that both Cedric Bordes (Tabou / GA Sails) and Cyril Moussilmani (RRD / Severne) would be looking to bounce back from disappointing results in Japan - 33rd and 21st respectively - and both men made a positive start today by earning top 10 finishes. Bordes took home 5th, while Moussilmani finished 10th. The latter did particularly well to fight back against Tristan Algret (Starboard / Severne / Chopper Fins) in the quarterfinals to grab the final qualifying position. Meanwhile, fellow countryman Pascal Toselli (JP / Loftsails) looks as though he is going to be extremely competitive again this season after matching his result in Japan in the opening race here - 5th. Jordy Vonk (Fanatic / NorthSails) has started the season brightly by qualifying for both winners’ finals so far this season. Today the flying Dutchman took home 7th and will be happy to have been in contention again. Amado Vrieswijk (JP / Severne) may be more known for his exploits in the world of freestyle (vice-world champion for the last two seasons), but the extremely talented Bonairean is starting to make his mark in both the slalom and foil disciplines too. The 20-year-old qualified for another winners’ final today and was disappointed to have his starting procedure disrupted by seaweed around his fin, but even so, 8th place represents a great start to the week and he could be one to watch over the coming season as he clearly has bags of potential. Last year’s World No.4 - Ross Williams (Tabou / GA Sails / Shamal Sunglasses) - may have missed out on the winners’ final but the Brit still kicks off the week with a top 10 result after winning the losers’ final ahead of Moussilmani, 19-year-old Basile Jacquin (RRD / Point-7) and Julien Quentel (Patrik / Avanti). The opening 7 heats of Elimination 2 were also completed, however, the decision was then made to stop the competition shortly after trying to sail Heat 8 with the low setting sun causing safety concerns due to the sailors being visually impaired. Tomorrow looks set to see a marathon day of racing, where not only sailing ability will determine the results as fitness/stamina are also likely to play a major role with WindGuru predicting strong winds - 20-28 knots - for the entire day. With this mind, and looking further ahead at the forecast, the sailors will meet again at 8am tomorrow morning for the skippers’ meeting with the action commencing from 9am (GMT+9). Don’t miss any of what promises to be an action packed day by tuning into www.pwaworldtour.com.